For successful professional men, dressing to impress is a delicate balance between blending in and standing out. Indeed, there are few articles of clothing that look better on a man than a well-fitted suit and there are only so many ways to reinvent that woolen wheel. Nevertheless, did you know that something as small as how your garments are hung can reduce the quality or even ruin the integrity of the fabric over time? That being said, the following is an overview of why all well-dressed men (and women) should own several luxury suit hangers prepared for usage at all times. 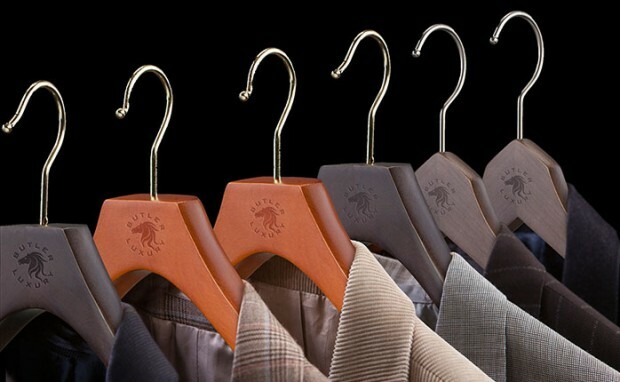 Beautifully crafted, the first reason to own luxury suit hangers is they add an upscale quality to your closet as a whole. These finely crafted, wooden items come in two colors– dark matte walnut espresso, and deep butterscotch –which can be all you need to add a bit of an understated flair to your surroundings. Available in an array of shapes and sizes, each type of hanger is perfect for a different type of garment. No matter the actual value of your wardrobe, by simply adding a few of these hangers to your collection, your closet will immediately look like a million bucks. Another reason to invest in these luxurious hangers is that they are both thick and durable. After simply holding these hangers in your hand, you will immediately realize the difference between these and your regularly used hangers. Smooth to the touch with a fair amount of weight to them, these solid wood hangers are made from German-imported, Grade A Beechwood, are clearly durable and provide the amount of protection needed to hang any of your lavish clothing for a lengthy period of time. Unique to some luxury suit hangers, the big, broad pant bar draped in thick, durable velvet, is built to disallow the slipping and sliding of the pants over time. This is an imperative feature as a large part of the reason some suits and garments are subject to physical damage in the fact that they slide off of unstable pant bars. What’s more, at the top of the hanger sits a tenacious, perfectly crafted hook complete with a nub at the very end that makes it easy to be hung in the closet or from the top of the door for long periods of time without twisting, turning, and/or falling off. Rather than being mad with the cheap materials that many other padded hangers are made from, these luxury hangers are made from 100% silk material. Coupled with a solid brass hook, this is the perfect way to secure and store your expensive clothes indefinitely. Made with smooth, European-style clips, these hangers are capable of holding and securing pants and skirt suits of all kinds. Keeping garments in pristine condition, owning a few luxury suit hangers is a great option for business women everywhere. A method to effortlessly sustain the finish and finely creased trouser, these hangers do so regardless of the material they are comprised of. The super thick velvet wrapped around the pant bar ensures that no impression whatsoever is left in materials. Overall, investing in luxury suit hangers like those from Butler Luxury is a great way to pamper your lavish wardrobe in between wearing and cleanings. Although they cost more, they are also highly durable which ensures that they will be around for many years to come. While they are clearly an optional addition, after witnessing a few garments become all but ruined due to the usage of cheaper, more inferior hangers, you will likely realize how vital items such as these are to the integrity of your wardrobe.